Yesterday I tried to make fallow deer ribs in a slow cooker. With beef ribs, I cooked them in a temperature-controlled slow-cooker for about 12 hours at 75 °C = 167 °F and they where amazing! Done the same with fallow deer ribs, and they came out so dry that I had to cut the meat off the bones and blend it with hot water into a creamy soup to be able to eat it somehow. I happen to have a moisture analyzer, and the meat after being slow cooked had only 55% moisture, while raw had 75%, so it lost 60% of its water during cooking. Fallow deer is more tender then the common red deer, and also less fatty then beef I think (at least this piece). I even wrapped the whole thing in large cabbage leaves to prevent moisture loss, but it didn't help. I find it difficult to find a good way to prepare something which is on the bone, but so lean and tender. I find it easier to do with tough and fatty meat. Despite the meat attached to the bone being very tender, the bones are holding tightly, so I can't cut this into rib chops - I don't think I have a tool which can manage to cut this. Boneless pieces of fallow dear I just sear for a few minutes on a pan and they are tender and great. But here I wanted to do something so the meat falls off the bone nicely, so I slow-cooked it, which ruined it. 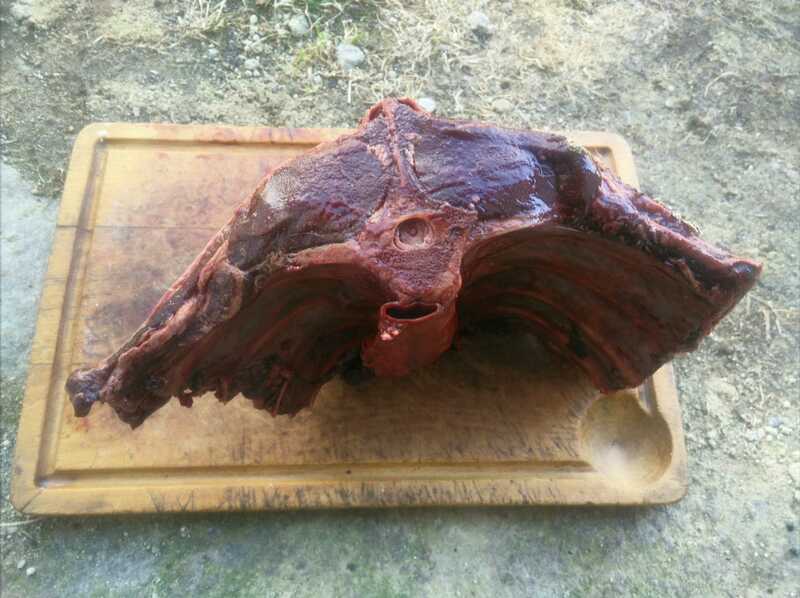 I have another fallow-deer rib rack like that, how not to ruin it this time? Is it possible to cook this properly in a slow cooked and/or in an oven, and if so what temperature and time to use in both cases? The whole thing weights about 2 kg (4 lb). You will not succeed in slow cooking your deer to a nice, flavourful dish. There is not enough collagen or fat to do so; this is generally true of wild game. It has occasionally worked for me with rump or brisket from an older moose, but even then, the rump would have been better ground. You appear to have the backstrap (loin), which is one of the two best cuts for steaks (the other being the tenderloin). I would suggest that you make medallions (e.g. venison steak Diane). Also by the same author here is a general discussion of deer steaks. If you really do want to roast it, it should be barded (surrounded in fat such as fatback or bacon) or larded (strips of fat threaded through it). I prefer larding as barding reduces the Maillard reaction. In any case, it should be cooked quickly. E.g., an interesting recipe - which I have not tried - is here at Serious Eats combines roasting with post roasting browning. I think this is as slow as you can do it. Finally, a hacksaw with a medium blade can work as a meat saw if you want to try chops. A wood saw can sort of do the job, but the coarser teeth tend to produce an excess of bone splinters. Best of luck and don't forget to use your previous piece to make a great brown stock. Not the answer you're looking for? Browse other questions tagged meat temperature slow-cooking venison or ask your own question. How should I prepare venison hind leg sous vide? how to cook nondescript venison in a cast iron pot so its tender?